Southern Comfort offers the Combination Units and Modular Bookcases collection which is one of the Best Selling bookcase collections. The reason is they are so versitile that they can be manufactured to the customers own requirements. These individual freestanding units are bolted together to create a complete fitted bookcase system. Although the items below are of a standard size, we are able to offer bespoke modular bookcases to your own specifications. Please forward you wood finish, sketch and dimensions for a quote. 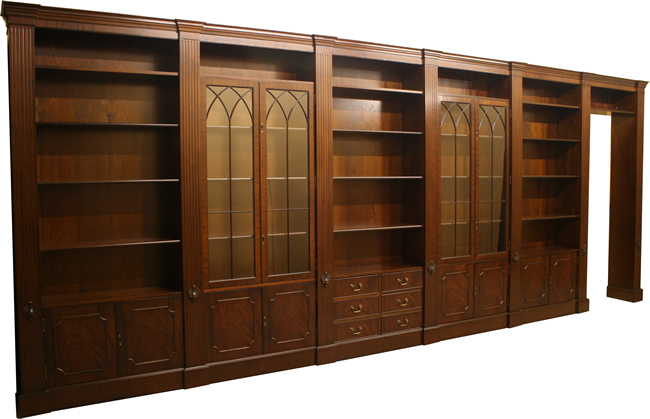 All of our modular bookcases are available in Mahogany, Yew, Cherry, Oak, Burr Elm, Burr Walnut or Poplar. 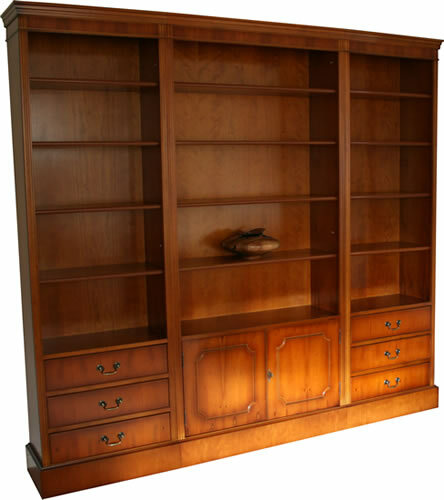 Above is an example of a bespoke modular bookcase in Mahogany finish. This piece has been manufactured with traditional door barring and a bridging unit on the right end to go in front of a door. As you will see above these bookcases have reeded columns between each unit. If required we can offer columns on any of the modular bookcases, please contact us for more information.